Before you pack up your gardening supplies for winter, it is vital that you take precautions to protect your young trees from animal damage over the winter months. Deer, rabbits and voles, among other creatures, are active all year long and can cause great harm to your trees in winter. Learn how to protect your investment. As a gardener, there's nothing worse than awakening at dawn to the sound of your neighbor's voice floating in through the open window as they shoo a deer out of their yard. I knew just where that deer would head, and a quick inspection of my hydrangeas later that morning confirmed it—the fresh new growth and buds were now MIA. Those darn deer! While we tend to remember to protect smaller plants like annuals and perennials in our gardens from critter damage, we often overlook our trees. Small trees are incredibly vulnerable to several types of animal damage in fall and winter, so it's wise to take steps to protect these investments. The shredded bark on this young tree shows the classic signs of buck rub. In late summer through early fall during rutting season, male deer will rub their felted antlers against young trees to wear off the velvet. This is called "buck rubbing." Smaller caliper trees, one to four inches in diameter, are most often affected. Those with thin bark like birch or redbud trees are particularly susceptible, though damage is possible on all kinds of trees. If the bark is rubbed off around the entire circumference of the tree in a complete ring—a process called girdling—it will die. Most trees will recover from damage to a small section of bark, though they may lose limbs above the damaged area. When an animal rubs or gnaws off the bark all the way around a tree, the pathway that carries energy down from the leaves to the roots is disrupted. While water can still flow up through the woody xylem of the trunk and branches, the leaves cannot send energy back down, so the roots starve, and eventually the whole tree does too. Rabbits remain active all winter and can do major damage to trees and shrubs. 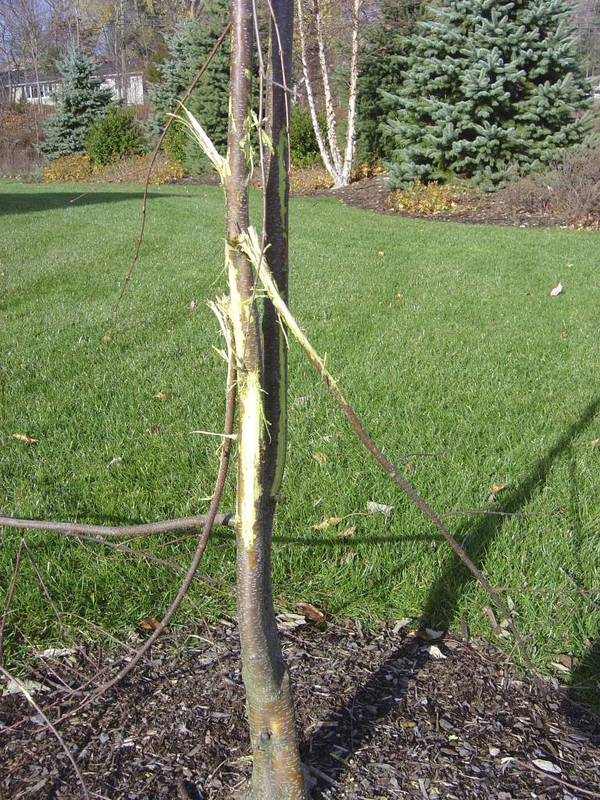 While deer tend to damage parts of the tree higher up including bark, twigs and buds, voles and rabbits can damage the lower two feet of the tree. Voles will chew on tree bark just under the soil surface so the damage is often not noticed until the tree begins to decline. Rabbit damage is easier to spot, as they tend to gnaw bark a few inches above the soil surface and up to two feet up the trunk. These animals will burrow under the snow and chew away to their heart's content all winter without you ever spotting them. 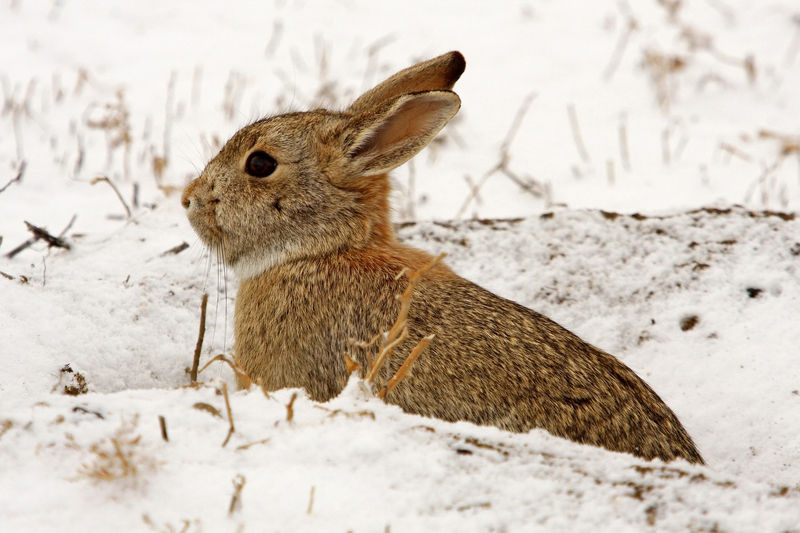 Rabbits will also stand on their hind legs atop packed snow to reach the bark. Since we tend not to inspect our trees in winter, often the damage isn't spotted until spring. It is essential that you take steps this fall to protect your trees from animal damage this coming winter. Here are four things you can do now to protect your investment. 1. Use a repellent. While temperatures remain above freezing, spray liquid Plantskydd Animal Repellent on the trunks and branches of your smaller caliper (1-4 inch) trees. Keep in mind that deer will stand on their hind legs if necessary to reach the branches, so spray them at least as high as you can reach. The repellent will need to dry for at least 24 hours in above-freezing temperatures to have the maximum long-term protection, so do it now before winter weather arrives. If you have just a few trees to protect, buy the ready-to-use bottle. If you have many, it is more economical to purchase the powder concentrate and make up your own in a spray bottle. Plantskydd was first developed in Sweden for the forestry sector to protect the trees through six months of winter. It is now used by many orchards, vineyards and wholesale tree growers to protect their crops. Since many home gardeners prefer to use organic products, this OMRI Certified animal repellent has become very popular since its introduction into the retail market. It delivers a better value because, unlike most other repellents that wash off in the rain, Plantskydd is rain resistant so you won't need to reapply it as often. 2. Make a physical barrier. If you have just a few trees to protect, you could make a physical barrier around them using hardware screening (1/4 inch holes) or a double layer of chicken wire with the holes not aligned. Keep in mind that rabbits can fit through a two-inch hole but can't jump more than three feet high. If you live in a snowy state, your barrier should be 18-24 inches taller than the anticipated height of the snow cover. Form a cylinder, taking care to secure the ends together tightly and use landscape pins to anchor it into the ground. If it is possible to set the barrier down into the ground a few inches without damaging the tree's roots, do so to help prevent vole damage. Take care to leave enough space around the trunk and branches so they will not rub on the barrier when the winter winds blow. 3. Wrap your trees. Check your local hardware store or garden center for white paper, fabric or plastic tree wrap. This is a physical barrier placed directly on the tree trunk in a spiral fashion from the ground up to the first branch. It helps to prevent damage from buck rub and from smaller critters gnawing at the bark. It's not the prettiest option, so if appearance is a concern, Plantskydd Animal Repellent is a better choice. If you decide to use a tree wrap, be sure to remove it in early spring so water does not seep in and start to rot the bark. 4. Move your mulch. Gardeners often hear that we should mulch our gardens in fall to protect the plants' roots in winter. While that is true, it's important to keep the mulch a few inches away from the trunks of our trees. If mulch is piled against the trunk, mice and voles can burrow in and girdle the tree without anyone noticing. This is a good practice to keep all year long, as damp mulch can rot the bark or crown of all kinds of plants. Susan Martin is an avid zone 6 gardener, garden writer and speaker who enjoys spreading her passion for plants to her fellow gardeners. Follow her on Facebook @Gardener Sue's News.